A dear friend in highschool texted me if I can attend at her birthday dinner on Feb. 5 and fortunately, I don;t have any appointment or major works that time so I happily went to their house. 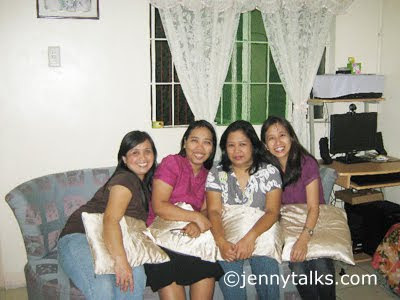 Actually, my 2 other friends with Lhen's husband went to their house all at the same time. All along we thought that there'll be other visitors but to our surprise, it was only us. Dinner was sumptuous and of course it was not complete if we didn't have lots of chika chika. Our talks were endless and if not for a friend's husband who wants to go home already then for sure we'll be chatting till midnight or so. I went home early around 11 pm and my mom was even shocked to see me go home early..lol She thought I'll be home by 3 or 4 am but I told her that it was not a big reunion. Anyway, I had so much fun with my friends and we're hoping to get together again maybe go shopping, eat out, play badminton or go out of town. I can't wait for that.